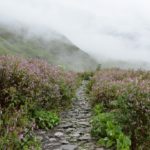 Valley of flowers is not just a trek, it is a walk amongst the floating clouds; a surreal experience of a slice of heaven. With the valley blooming with a plethora of colours on one side, the snow clad mountains on the other and the alluring river dividing them, the scenery is picture perfect. The river flowing through the valley! 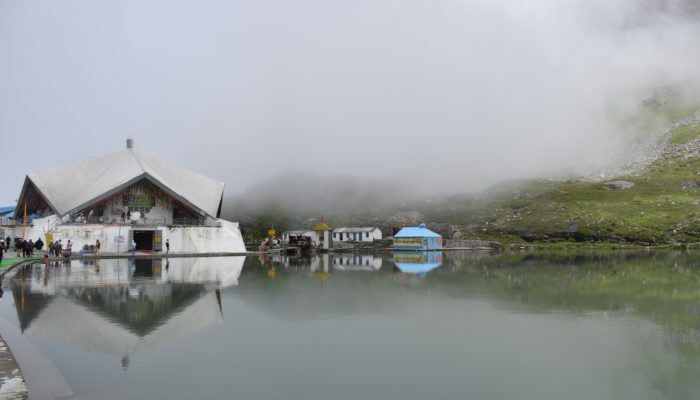 Add to that, the trek to Hemkund Sahib, the calm and secluded; highest gurudwara in the world and the scenic freshwater lake at 14,200ft., this is a must do trek for everybody. 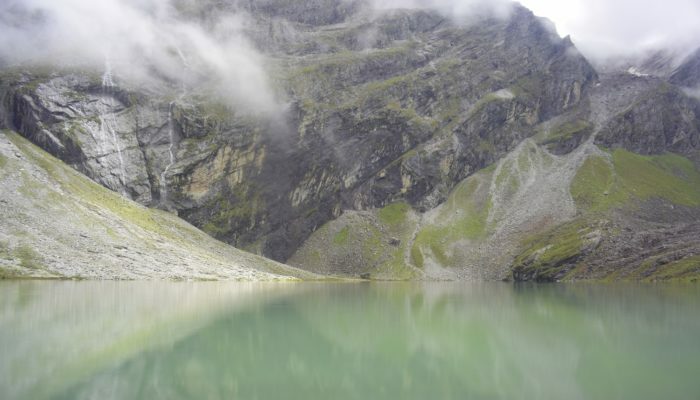 Hemkund Sahib and the freshwater lake at 14,200 ft. The journey starts from Gobindghat, which is a 15-16 hour drive from Delhi. I took a bus to Haridwar from Delhi at 10.30 pm and reached by 04.30 am. 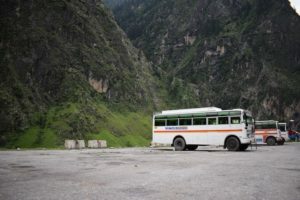 Within 15 minutes, I was already on the bus to Badrinath which would drop me at Gobindghat. Kudos to the drivers in the hills who drive through such treacherous roads! I reached Gobindghat at around 4 in the evening. There are only a handful of hotels here but there would be no problem finding a room unless it is an extended weekend. The prices are low and the food is more than decent considering the altitude. Checked in, refreshed, took some rest and went for a walk in the town. 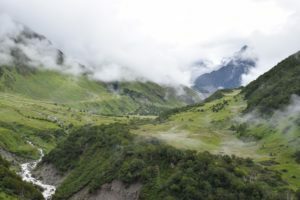 It was gradually swarming up with trekking groups and pilgrims. The evening was spent talking to the locals and enjoying the tea and food in the wonderful weather with raindrops falling seamlessly and endlessly till the next morning. The trek to Ghangaria from Gobinghat is 13 km but you can take a shared cab to Poolna which decreases the distance to 9 km. The trail is alongside the river and well defined. Dhabas can be found at regular intervals. 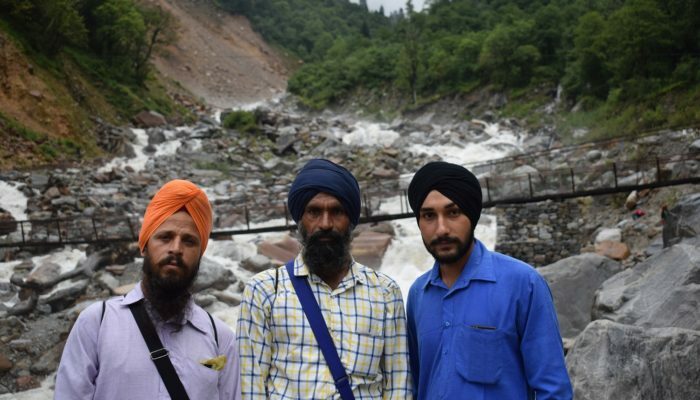 Sikhs pilgrims can be seen on the way making their holy journey to Hemkund Sahib. A lot of them I met were either from Jalandhar or Amritsar. To my surprise, I also found a lot of trekking groups from Mumbai. Started early in the morning and reached Ghangaria by noon. There were a lot of hotels/lodges and I rented a room for 3 days for my upcoming treks to both the valley and the gurudwara. Resting at a tea shop - Bagpacking to Ghangaria. The route is filled with amazing scenes throughout. Fellow travellers all the way from Jallandhar on their holy journey to Hemkund Sahib. The transport medium for the old, children, tired and the lazy. Tents at Ghangaria with the backdrop of hills and the floating clouds ! The way to the valley opens at 7 am and the last visitor is allowed till noon. We had to wait till 08.30am due to heavy rainfall which is an alarm for any landslide on the trail. The route though not tough is but slippery and treacherous. 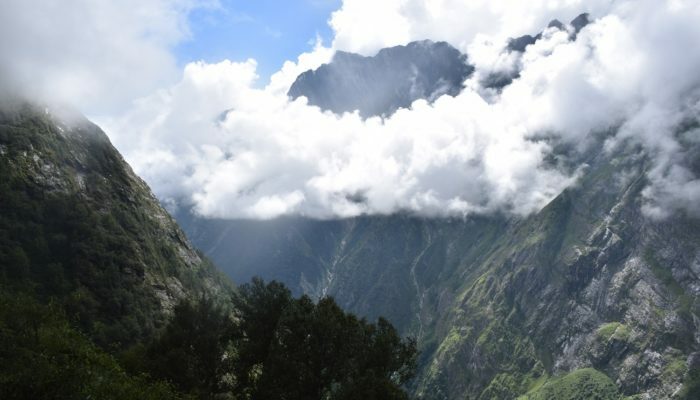 The trek is picturesque and you get a glimpse of the valley and the glorious mountains. It is beautiful with waterfalls every few hundred metres and flowers blooming on both sides of the trail. 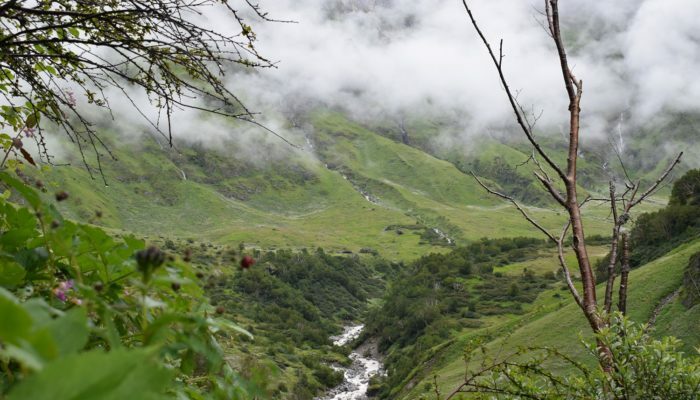 Once you reach the valley(about 3.5 km from Ghangaria), you will be in awe of what you see. Words fall short in praise of the wonder this place has to offer. Flooded with flowers – pink, green, white and even black, this place is a leaf out of the heavenly tree. 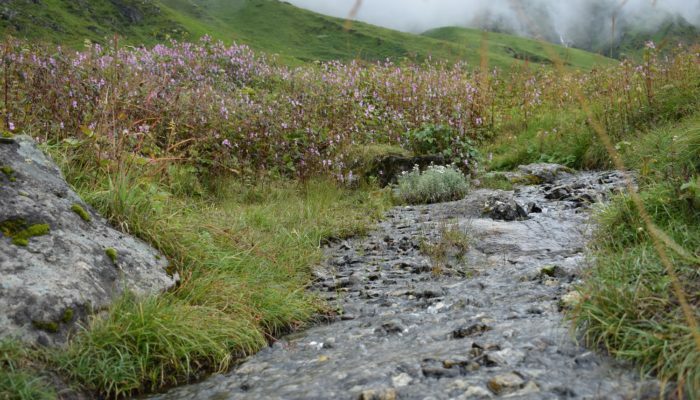 Small streams flow throughout the valley, which stretches a further 7-8 kms. Since it is a world heritage site, there are no food stalls. Lunch has to be packed and carried and the journey back also has to be made on the same day. 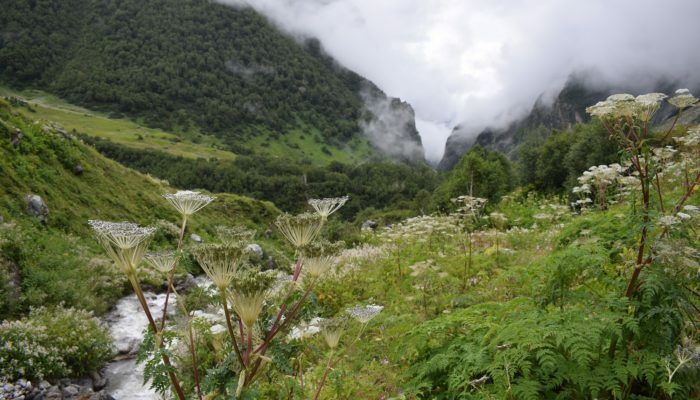 The first glimpse of the valley of flowers from the trek. 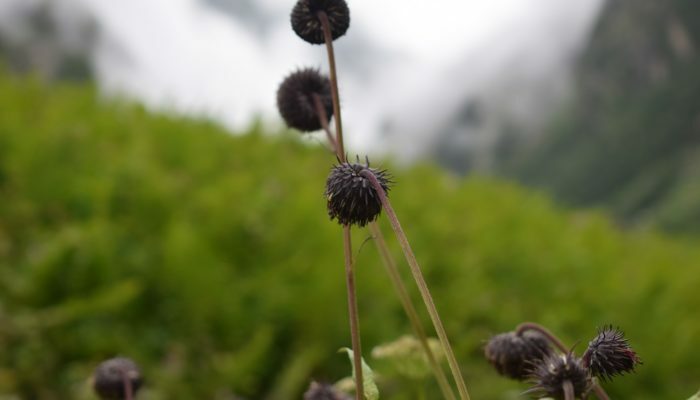 On the trek to valley of flowers ! 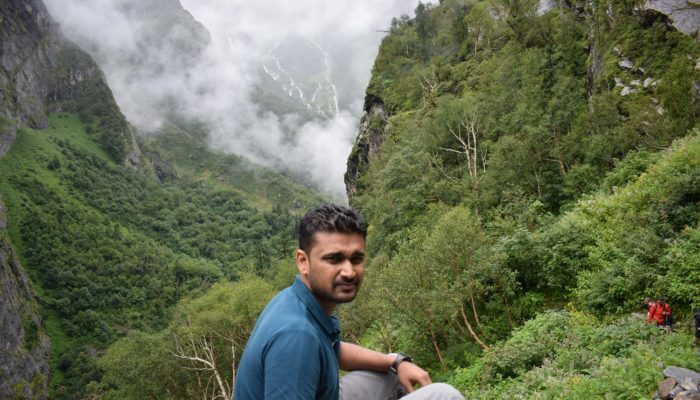 Waterfalls, clouds, mountains- the place to be. It takes time to soak in the beauty of this place. Uncle from Haldwani trekking all alone and as excited as me. Fit as ever even in his 50's. Carpet of white, yellow and pink. 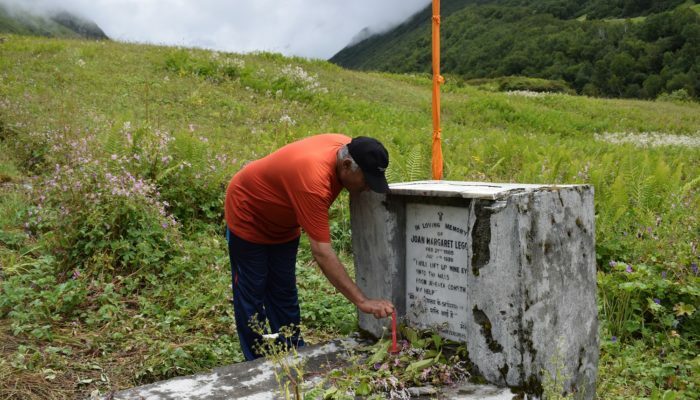 Uncle from somewhere in Maharashtra, lighting a candle at the tomb of Joan Margaret Legge - the botanist from England who died while collecting flowers in 1939. After returning back from the valley, I got a leg massage done in the evening and boy, it was worth it. 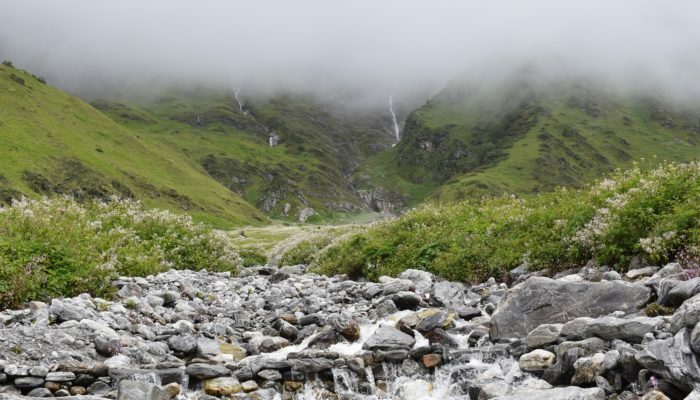 I knew the trek to Hemkund(6-7 km steep uphill) was never going to be easy, also considering that I had been trekking the past two days. I started early again the next day. Although I got tired within the 1st km, the enthusiasm of the mini Punjab that was here, drove me. Sikhs mostly elderly and between 40-60 and even in their 70’s were walking in their shoes and even slippers with bags and a stick in their hand. No fancy branded shoes or trekking gears. Nothing. Faith really is something. Maybe everything. And then I met people of a third kind. 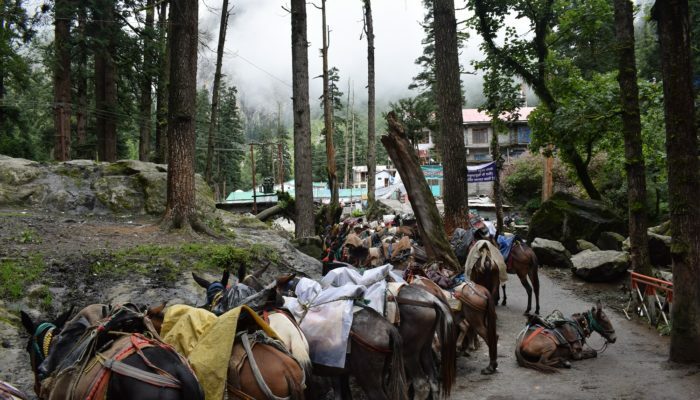 Young, loud, cheerful and energetic people shouting slogans and speeding their way on the not so easy trail but seated comfortably on their ponies with their bags tied to the burden bearer. You guys for sure will conquer the world someday(on the ponies). In about 4 hours, I made it to the gurudwara. Warmed up with tea and khichdi at gurudwara langar. Though I do not like the idea of having khichdi until my teeth part from me one day, I was grateful enough to have whatever was on offer here. It is worth commending the efforts that go to make it possible at such a height. The serene lake stood between the gurudwara and the mountains. It reflects the grand mountains and is a sight to behold. 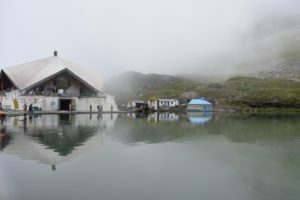 Hemkund Sahib- the highest gurudwara in the world! 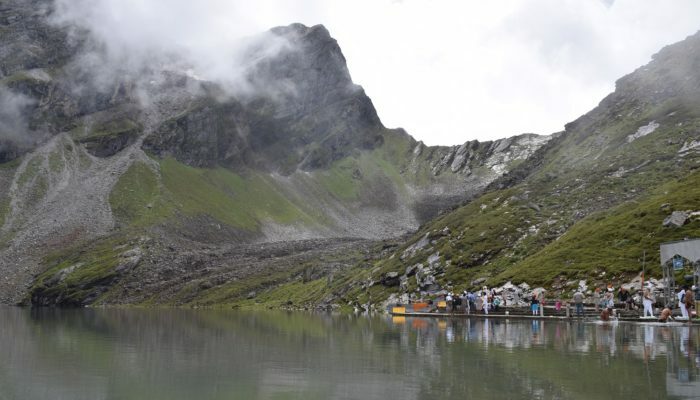 The serene lake at the height of 14,200 ft.
Pilgrims taking a dip in the cold water in the lake. Pilgrim all the way from Amritsar to offer his prayers. Do the clouds want to convey something ? It remains open for 4 months i.e June-September but I would advise to visit it in the months of July and August. That is when you would get to see most of the flowers. Try NOT to visit the place on the Independence day extended weekend, both for the crowd and the surge pricing of rooms. Leave early for the valley and gurudwara to spend maximum time there and since you have to make your way back the same day before nightfall. Raincoat/Poncho is a must since this is a monsoon trek. If not raining heavily, it would be drizzling most of the time. 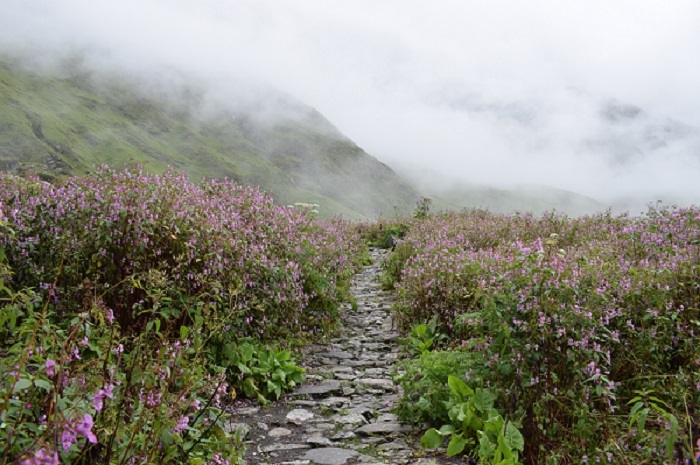 Trek cautiously since the wet and rocky path becomes treacherous in the monsoon weather. Get adequate rain care/protection for your rucksack and camera. 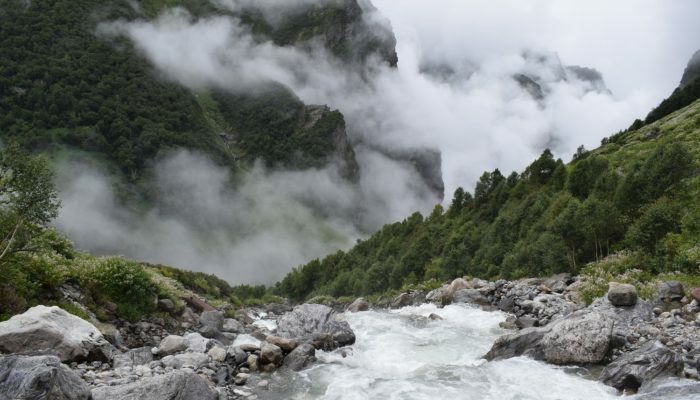 Get a leg massage done before(or after if you may) you make your trek to Hemkund Sahib. Solo Trekking: Obviously possible. I did it. You can too. 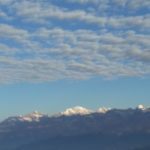 Explore more Treks near Delhi. Thank you Debabrata. Would love to write up on your adventures someday. Kudos, keep it up my Son, you have it written it very nicely. The selection of words is also improving. Well done. Yes Khush. The place is more beautiful than the pictures and is a must visit. Travelling is nothing but a deep meditation & no words can explain it’s worth when it comes to a solo trip to the lap of Himalays. Keep it up my friend. Hope to see you in more pics next time. 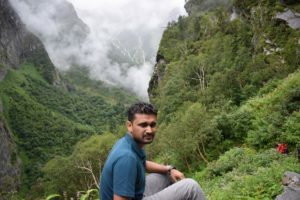 Your details for this trek are complete & pictures are beautiful. After reading this one, I am also planning to do this one as a small training for the upcoming EBC. Thank you Hanish bhai. When are you planning EBC ? Nicely compiled & at the same time,some very useful info also. Thanks a lot. People like you inspires a lot others. Thank you. Yes that is the objective. Keep travelling ! 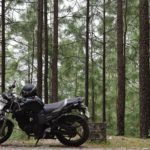 Is it preferable to go by bike to the gobindghat from delhi? Hey! 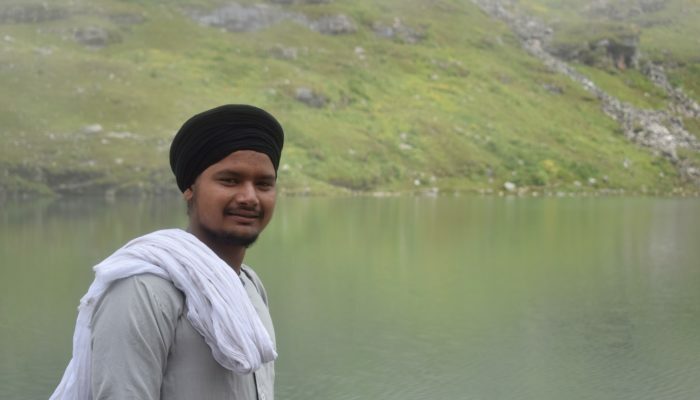 Very interesting pictures 🙂 Seems like a super trip you had to VOF and Hemkund Sahib. 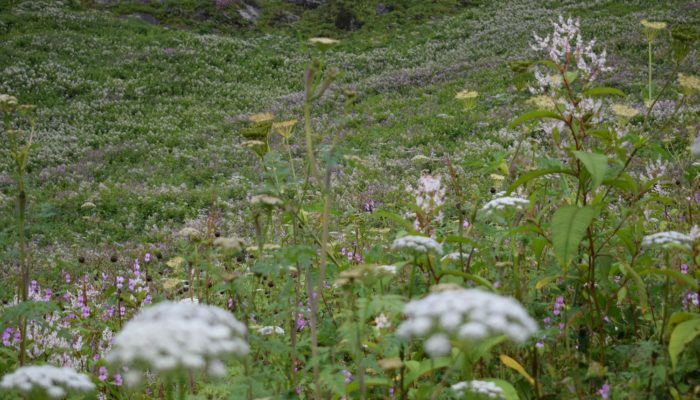 I am planning to visit Valley of Flowers and Hemkund Sahib in mid June. Do you think this place is safe for a solo woman traveler? 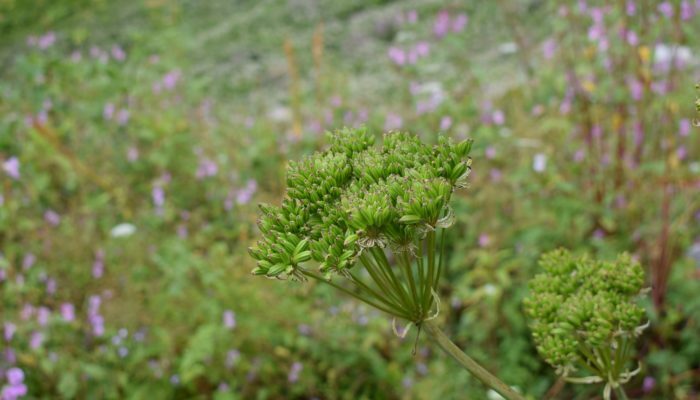 Also do they have markings/ signs/ trails inside Valley of Flowers – can you share some more info on the route inside the valley? Yes indeed it was one of my best treks and the most beautiful place i have ever been to. There is only 1 route to VoF from Ghangria. No there are no signs as such but the trail is well defined. Inside the Valley though you can trek as long and deep (not too many routes though)as you want but remember that you have to make the same journey back too. I trekked not much beyond Joan Margaret’s tomb. Hey! Thanks so much for the prompt reply. One last question – Does the VOF also have a defined trail that one can follow once you cross the entry point? Yes it does. But the main trail will diverge into smaller trails. This trek doesn’t need any tour operator. Any good budget hotels or lodges? How do we book? We are planning to go in group from bangalore. Can you tell little about the budget part as we are thinking not to go by any travel planner ? Yes, this trek can be done without any agency. Wow amazing.your details for the trek are really helpful.thanks sir! That it is helping you is enough motivation for me ! The trek would certainly not be easy with your kid. 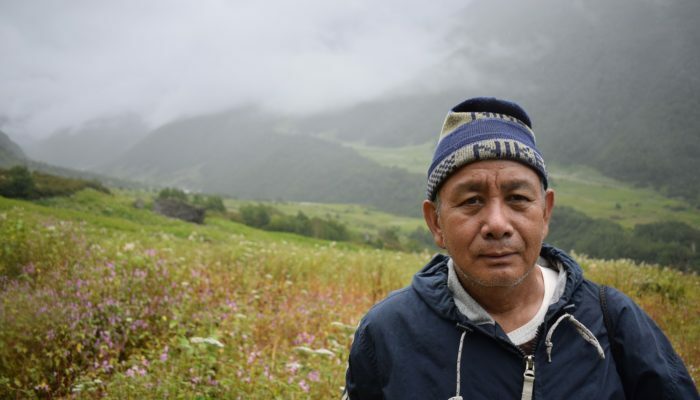 But then there are porters and ‘Pittus’ who would come to help. That makes it doable. 🙂 But i am not sure if kids(2 year olds) should be taken on a trek which is slippery(and rainy) and at a height of around 14,000 ft. I really do not know. Could you also let me the know the things to carry. This is going to be the firsr trek of my life. I am a little nervous on the first hand but determined on the other :). Worth to mention, I got a strong feeling after reading this, very nicely written. 5. Trekking pole (A stick would suffice too), apart from the basic necessities. Could you please tell if we have to carry any documents or proofs. Is there any permits to take ?? Yes. A photo/address ID is a must. Well, that is something which should be taken everywhere while travelling. Permit is provided near Ghangaria by filling a simple form and showing your ID. Simple process. This can be done when you start the trek to VoF. Where all did you stay? Any good budget hotels or lodges for a family of 2. Can you suggest names of hotels, planning Aug first week. I really do not recall the name of the guest house. There are though plenty of hotels/guest houses at Ghangaria. If you do not want the trouble of finding one on the spot, you must search online. First week of August can be crowded. Great article. 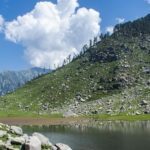 Can you recommend some lodges on trek route? For staying in Gurudwara do we need to contact in advance? 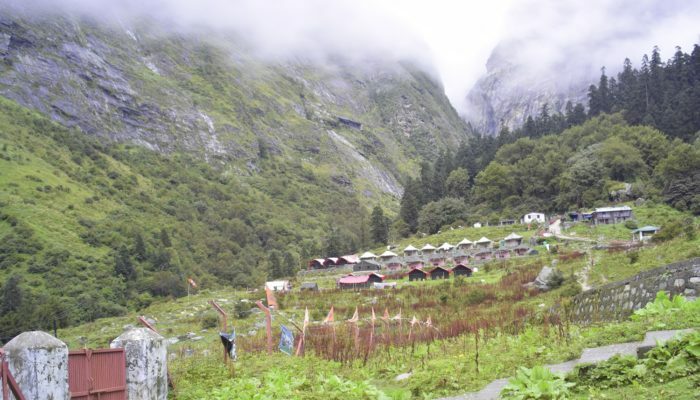 Lodges would be available first at Gobindghat and then when you reach Ghangaria. They are pretty decent although i cannot recall any. Not too sure about the gurudwara too since i stayed at a guest house itself which i rented on the spot. should i go with two bags, one which i keep in my hotel room and other which i keep with myself during track? Yes that is correct Prashant. Keep a smaller one (max 20 ltrs) as your day bag for treks to VoF and Hemkund Sahib. Got all the required information! Thanks much. Great article indeed. Hey there. Loved reading your blog. I’d like to know some more details about the trip. Will you be able to help me out with that? I want to do the trip on my own and not through any agent. Do I have to take permits for the trek, beforehand? Are there marked trails? And what about the lodges? How much in advance do I have to book? Planning to go in July 2019. Many thanks in advance. Thank you. Yes you can absolutely do it on your own. No prior permits or booking required. You’ll find a place on the spot. Also, the permit is available at the check point to the Valley. Yes the trail is marked and doable. Can be go to haridwar frm kolkata via train….then from their to badrinath via bus? Yes why not, if there are trains to Haridwar from Kolkata. Or reach Delhi and catch a bus to Haridwar. It is only about 5 hours from Delhi. 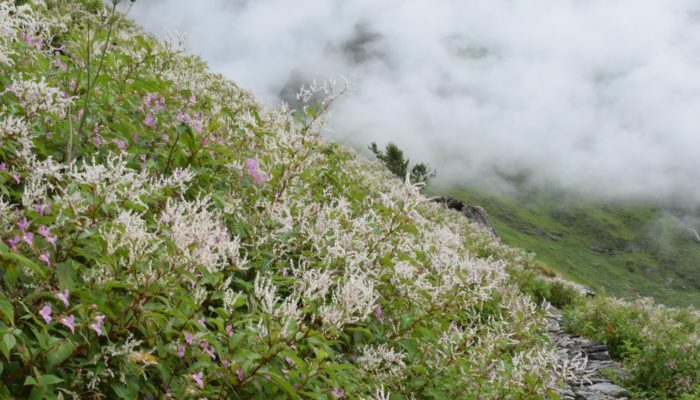 I am planning go for trek to valley of flowers with my wife . We will be reaching at GovindGhat on 13th August. We haven’t book any stay options so far. 1. 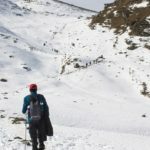 Is it ok to go as individual or recomanded to join any trek group? 2. 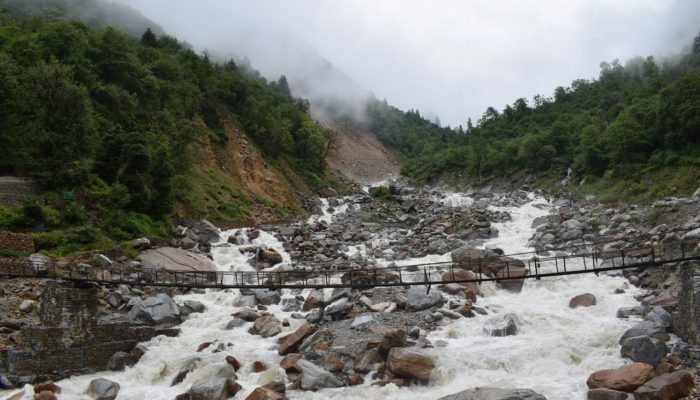 Heard about landsliding, did you experienced any such thing or extreme weather conditions ? 3. pre booking is required or run time stay options would be available? – in case pre booking needed then any suggestions for the same? 1. Yes. Absolutely no trekking group required. 2. It is monsoon. Would be drizzling most of the time. Rest it cannot be predicted. All went well with me. 3. I am afraid that you should pre-book since you are travelling on independence day weekend. It would be too crowded and the prices would surge. You should look up online for that. 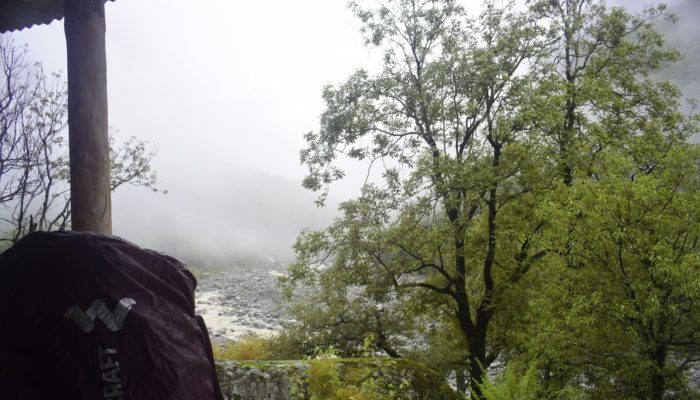 Is it will be ok to travel in the end of August …..i have fear of rain…..and flood …?? Yes I did too. This is a monsoon trek. It would be raining/drizzling most of the time. Don’t worry. Just leave. Everything should be good. No one can predict what is coming. Thanks! It’s a nice write-up. Is booking rooms in advance recommended ? As I am not sure about places in esp in Ghangharia. How about shared taxis from Haridwar to Govindghat ? And how about the gear, how cold is it usually? Not really.You will find rooms on your arrival at Ghangaria. Buses and shared taxis go to Gobindghat. You may though have to wait a little for a shared taxi. It is usually drizzling. So you must have a poncho/raincoat and shoes with a good grip. Carry a jacket too. All the best! Is it a very though trek? Thank you. Not quite tough. But you definitely need to have basic level of fitness. It is certainly doable for a beginner. The blog is amazing. I’m a solo Traveller, planning to go in July 2019. Do I have to book for trek pass in advance? And also, can I do the trip on my own without any agent? Do you see any issue if I go there with my two year old baby???? Amazing blog btw. Taking your 1 year baby may not be the best idea since the trail is slippery and at the height VoF is, oxygen levels can be a concern.